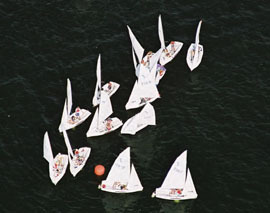 Although there are no spinnakers in high school sailing, the downwind legs are far from a parade to the next mark or the finish; with good technique, you can make significant gains. To be aware of and to react to strategic considerations such as the effects of current or better wind pressure and tactical considerations such as getting inside overlaps on other boats, both skipper and crew need to keep their heads outside the boat throughout a reach or run. But to get your boat where you want it to be, you need to maintain top boatspeed through jibes and transitions between reaching and sailing dead downwind. When reaching in a 420 or Flying Junior, the crew will generally be trimming the jib with their arms outside of the shroud on the leeward side of the boat. Unfortunately, if you’re comfortable, you’re probably not at top speed! In heavier breeze, the crew may need to be in the boat or hiking, but should always be very cognizant of the shape of the jib and be sure that the top of the sail is not luffing. In light or medium breeze, the skipper can get a better feel by trimming the main one to one. On a reach, the centerboard can be about halfway up and you should aim to keep the boat flat. Constant communication between skipper and crew is very important as the crew needs to tell the skipper how much pressure they feel in the jib. If there is not enough pressure, the skipper should head up slightly and if the pressure is strong, the skipper can bear off slightly. When sailing dead downwind, the skipper should be holding the jib on a wing by grasping the jib sheet outside of the windward shroud. The crew should then be holding the boom out and balancing the boat with a slight windward heel. The centerboard can be almost all the way up, though in heavy breeze you may prefer it halfway. Again, teamwork and communication is vital; the crew has the best vantage point to look for puffs and to adjust the weight balance in the boat. If the crew feels the boom about to jibe, they need to say something. Jibes and transitions between the reach and wing can make a huge difference on the racecourse. When jibing reach to reach, the jibe starts with the crew coming to weather, which bears the boat off. The centerboard should be all the way down for the jibe. As the boat goes through dead downwind, the skipper can grab the parts of the mainsheet to pull the main across in a controlled manner. At the same time, the crew should bring the jib across and trim it as quickly as possible – the sail should not luff. Once the sails are across and the boat has rolled, the skipper can cross the boat and flatten. In heavier breeze, the crew may also need to help flatten – and must have the jib sheet in hand to avoid luffing the sail when this happens. Once settled onto your new course, pull the centerboard back up and get your heads out of the boat to find the next puff! Wing to wing jibes are a bit more complicated. The skipper’s goal should be to jibe the boat without actually moving the tiller. Again, the jibe starts with the board going down and the crew coming across the boat. The crew should not switch the jib over yet, but must have both sheets in hand. The skipper can grab the parts of the mainsheet to pull the boom across and then switch sides of the boat. Because you roll slightly through the jibe, your apparent wind will go forward and the jib may not want to wing immediately. Be patient – don’t force it! When going from a reach to a wing, or when finishing a wing to wing jibe, the crew needs to pull the jib across the boat quickly and the skipper needs to grab the jib sheet forward of the shroud. Different crews and skippers have varying opinions on the best way to do this, but a safe way that does not put too much weight on the windward rail is for the crew to pull the jib sheet through the block on the weather side to rapidly pull the sail across, and then ease the sheet out to a proper setting while the skipper reaches forward. To transition from a wing to a reach, drop the board all the way down and head up by heeling the boat to leeward. The crew should move to leeward (it may feel like you’re about to dive in the water, but have confidence in your skipper!) and prepare to trim the jib for a reach. As the jib begins to back, the skipper can drop the sheet and let the crew take it, while quickly reaching to trim the main in and flattening the boat on the new reaching course. All of these maneuvers require teamwork, communication, and coordination. They don’t come easy, but with practice, you can make significant gains on reaches and runs!